Finally Italians, Kiwis, and lovers of Italian culture have an opportunity to enjoy the very best that Italian Cinema has to offer. Paolo Rotondo and Renee Mark have put together a superb offering of new films and return hits from Italy’s dynamic film industry. With the support of the Societa’ Dante Alighieri, The Comites, the Italian Chamber of Commerce and the Italian Ambassador to New Zealand – Carmello Barbarello and the following sponsors Non Solo Pizza, Peroni, Studio Italia, San Pellegrino, Vigneti Zabu, Banfi, Carpineto, Solerno, La Bella Italia, Scopa, Davines, MOR, EDIT., Boffi and Giapo we will present a stylish and high-quality selection of films that is worthy of the brand ‘MADE IN ITALY’. The history of Nelson's Italian community, with its close links to Italians living in and around Wellington, has gone largely unrecognised, until now. The small but vibrant community is historically significant and nationally important as a distinct migrant group, and their place in Nelson city's social, heritage and economic fabric is now the subject of a comprehensive history book. Following five years of research and interviews, Karen Price and Karen Stade have written Pasta, Prayer & Promise, the story of Nelson's Italian community 1862 – 2014, a substantial book recording Italian contact with the Nelson and Wellington regions. Lavishly illustrated, it examines why Italians chose to leave the country of their birth and travel half way around the world to settle in Nelson, New Zealand. Pasta, Prayer and Promise also explores subsequent waves of chain migration (the 1950s and more recent arrivals) and the close family links with Wellington’s Italian communities, which continue to this day. The individual migration stories of 32 of the families who settled in Nelson prior to World War Two are also told in the book, many of whom will be well known to the Wellington community through business and marriage ties. Neither author has Italian heritage but Karen Price grew up in The Wood and Karen Stade has lived there since 1987. She says both have witnessed major changes in the area and were keen to document the stories of the Italians who helped establish The Wood as Nelson’s own Little Italy. Karen Price, who has run Nelson publishing company Contexo for the past 12 years has worked on many local history books including The School on the Hill, which she wrote for the 125th jubilee history of Nelson College for Girls. Long-time Nelson history writer Karen Stade has produced numerous books and has worked on several exhibitions for the Nelson Provincial Museum, including its current one, World War I: Their Stories, Our History, which features the story of a Nelson Italian who was injured at Gallipoli. Pasta, Prayer and Promise can currently be bought at La Bella Italia in Petone or contact the authors for stockists. info@contexo.co.nz, Phone (03) 546 6394, 027 238 1819. Food and migrant history are the themes of a special and unusual new book. The book, Food and Family – Tastes and Memories of Italy - reproduces the memories and food recipes of migrants from a small town near Naples who came to Wellington before and after the Second World War seeking a better life. When they came to Island Bay on the south coast of the Capital where many of them became fishermen they found a limited and uninviting food culture of beef or mutton and tasteless veg and so had to find ways of fulfilling their love of the rustic Neapolitan cuisine they had left behind. Back home in Italy they could not afford many of the foods they enjoyed but life in New Zealand from the 1930s provided opportunity and earnings they could only dream of back home. The problem was that in their new home country there were no Italian food stores, butchers or bakers and the greengrocers didn’t have the distinctive vegetables of home – zucchini, eggplant, artichokes, pulpy tomatoes, olives and fragrant herbs such as oregano and basil. So the Italian migrants addressed this in innovative ways. The mail home to friends and family in Italy told the tale of a country blessed in so many ways but lacking in the food department. So later migrants would bring in seeds to grow the vegetables; the men built glasshouses to accommodate their tomatoes, the women would share recipes and the rivalry over who could make the best pastries grew. Until the 1980s New Zealand’s restrictions on food imports were huge but, fortunately, olive oil, the lifeblood of Italian cooking, was sourced and allowed in, Australian Nanda pasta was sold but it took many years before cheeses and deli meats (prosciutto, salami) were allowed by the authorities. Food and Family is centered on the Cuccurullo family of Island Bay whose first generation sons have established the Mediterranean Food Warehouse chain of retail stores that stock many of the foods their grandparents missed. At the heart of the book are recipes from the wider Cuccurullo family and their Italian friends in Island Bay. Needless to say with fishermen and fishmongers in the family there is considerable emphasis on seafood dishes – but the variety of dishes is wide, ranging from how to make fresh mozzarella to the best way to make rum baba. The book is lavishly illustrated with photographs by veteran Wellington studio and food photographer Sal Criscillo whose parents were also migrants from Italy, but from the volcanic island of Stromboli, who came up the book idea over an espresso with the Cuccurullos. Food and Family – Tastes and Memories of Italy, is available from Mediterranean Food Warehouse outlets in Wellington, Lower Hutt and Kapiti and via their website www.medifoods.co.nz, and from Unity Books, Willis Street, Wellington. Book costs $35.00. From the back cover: Amidst an explosion of food and recipe books, many based around celebrity chefs, how can a new publication stand out from the crowd as deserving of the attention of readers and keen amateur cooks? Food and Family is more than just a food book. Its novelty and appeal is the way it canvasses and reproduces the food of Italian migrants who came to New Zealand before and after the Second World War. The book is about hardship in Italy, of surviving and prospering in a new land, of “making do” without many of the products of home (and their dislike of lamb, doughy bread and butter) and of learning from each other how to make many special and unique Neapolitan dishes while overcoming the absence of olive oil, herbs and much more. The basis of this book is the hand-written recipes from the Cuccurullo family and their friends in Island Bay, Wellington, and the drive and energy for sharing the cuisine of the Bay of Naples is the Mediterranean Food Warehouse chain of pizzeria and delicatessens established by the family. It would be simplistic to call the recipes “rustic” in the sense that they are home-grown, unrefined and not out of any restaurant or culinary school, but many offer even the keenest of cooks a decent challenge – everything from the taste sensation of spaghetti with crayfish to a step by step guide to making fresh mozzarella to reproducing the most delicate of pastries. From left to right, Nina, Gino, Teresa and Joe Cuccurullo. Sadly my father Antonio passed away on 22 March so was unable to see the book finished. The Società Dante Alighieri, Christchurch (www.dante.org.nz/chch) hosts Radio programmes on Italian topics; listen live or hear the podcast. Spectrum is a long-running documentary series – it began in 1972 – which captures the essence of New Zealand through stories, landscape and people. Sunday at 12:15 pm, repeated at 12:30am Tuesdays and 7:30pm on Wednesdays. If you did not get a chance to listen to the radio programme, then you can listen to it as a podcast. Left: Marco Sonzogni, Senior Lecturer at the School of Languages and Cultures at Victoria University, and the director of the NZ Centre for Literary Translation. Cavaliere Signor Giovanni Mersi is 83, and for the last 70 years he’s been the self-appointed guardian of 11 very special volumes. He rescued 11 of 13 of the first Italian edition (1787) of Captain Cook’s journals from a bombed out school house, thereby saving them for posterity. And now he’s passing on that guardianship to Victoria University. Amelia Nurse visits Giovanni to hear the story of his astonishing childhood in war-time Italy, and what these very rare books have meant to him. Cavaliere Signor Giovanni Mersi cutting the Cook Cake (imported from Italy of course) with Nina Cuccurullo, Administrator for the School of Languages and Cultures. The best of Italy is celebrated at a one day festival in Wellington organised by the immigrants’ 131-year-old social and cultural organisation, Club Garibaldi. The hunger and thirst for Italian cuisine and refreshments is satisfied by local businesses offering delicious pasta, pizza, risotto and home made pastries and sweets, beer, wines, limoncello liqueur and soft drinks. The crowd, which in the past has topped 10,000, is entertained by children dancing the folk dance the tarantella, opera singers, pop opera group Tres Belle and a band playing famous Neapolitan love songs. Here is the list of exhibitors and programme for the day! See you there! A presto! 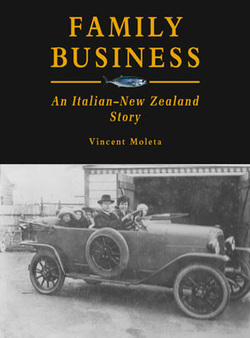 Family Business: An Italian-New Zealand Story is the work of Wellington-born, Australian-based medieval scholar and publisher Vincent Moleta who has written a moving account of his family’s determined efforts to establish a new life in a new country. Dr Moleta’s maternal grandparents, Bartolo and Giuseppina Barnao, were among the small number of non-British Europeans who immigrated to New Zealand, in their case from the Aeolian island of Stromboli, off the north coast of Sicily, at the turn of the 20th century. Through their story, and that of their descendants, Dr Moleta reveals how the small, tightly-knit Italian community became successfully integrated into New Zealand life while upholding their cultural traditions and practices. He says the lives of Bartolo and Giuseppina Barnao and their children “offer a model of how one might adapt to an alien culture, maintaining one’s own inherited traditions, developing new loyalties, cementing new friendships, and making a useful contribution to a distant land of adoption – in their case, proud Aeolian Italians then, and assured Aeolian New Zealanders now”. Family Business begins by tracing the childhoods of Bartolo and Giuseppina on Stromboli at the end of the 19th century, then follows Bartolo’s journey as he sails to Wellington as a 13 year old to work in the fish trade, his time as a cabin boy on a steam trawler sailing out of Napier and his two years driving a cart of freshly caught fish through the night from Makara Beach to the fish market in Wellington. Eight years after arriving in New Zealand Bartolo returned to Stromboli to marry Giuseppina, the bride the village parish priest had chosen for him. They returned to New Zealand, raising five children and establishing two successful fish markets that became well-known New Zealand institutions – in 1908 Barnao Bros. Imperial Fish Market in Main Street West in Palmerston North and, in the 1930s after Bartolo moved his family to Island Bay, Barnao’s Fish Market in Lambton Quay. Through these developments, Dr Moleta recounts the family’s joys and sorrows and paints an absorbing picture of life in Island Bay, New Zealand’s own “Little Italy”, from 1900 to the 1960s, describing the Fascist Club meetings of the 1930s, the visit to Wellington in 1934 of the Italian cruiser Armado Diaz, the Catholic tennis club socials and the excitement of Italian weddings. Dr Moleta says readers of Family Business will find out more about the traditions these Italian migrants brought with them to New Zealand, and how this small yet vibrant community contributed to this country’s growth and development.